Moonmadness is an album released in March 1976 by English progressive rock band Camel. It was their fourth album and the last to feature the band's original line-up (Latimer, Bardens, Ferguson, Ward). After the success of the tightly structured, instrumental The Snow Goose in 1975, the band added vocals to their music again. The album has an overall theme, just as their previous one did, but does not follow a storyline since it is mostly based on the band members themselves. As written in the CD Booklet: Overall, the tracks comprising the album were conceived as a loose concept based on the individual personalities that made up Camel; "Air Born" about Andrew Latimer, "Lunar Sea" about Andy Ward, "Chord Change" about Peter Bardens and "Another Night" about Doug Ferguson. The cover was designed by Field. The last song on the album, "Lunar Sea", ends with a minute-long wind-blowing effect. On some LP pressings, the record arm would skip during the end of this part and naturally return to the beginning of the effect, playing it endlessly (the "terminal groove" effect). In the Q & Mojo Classic Special Edition Pink Floyd & The Story of Prog Rock, the album came number 23 in its list of "40 Cosmic Rock Albums". It was voted no. 58 in the Top 100 Prog albums of All Time by readers of 'Prog' magazine in 2014. Camel performed the album in its entirety on a 2018 tour. ^ Jehnzen, Daevid (2011). 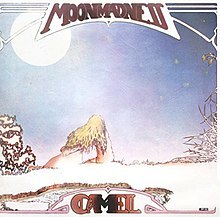 "Camel - Moonmadness (1976) album review at AllMusic". AllMusic.com. Retrieved 24 June 2011. ^ Q Classic: Pink Floyd & The Story of Prog Rock, 2005. ^ "Dutchcharts.nl – Camel – Moonmadness" (in Dutch). Hung Medien. ^ "Swedishcharts.com – Camel – Moonmadness". Hung Medien. ^ "Camel | Artist | Official Charts". UK Albums Chart. ^ "British album certifications – Camel". British Phonographic Industry. Select albums in the Format field. Select Silver in the Certification field. Type Camel in the "Search BPI Awards" field and then press Enter.